If your kids are anything like mine, animals are probably one of their favorite things. Whether it be house pets, or jungle creatures; an animal of any kind will hold their attention for hours! Around here, we love the Discovery Channel, especially the programs about animals in their natural habitats. You know, the ones with the awesome footage of birds swooping down in slow motion to grab fish out of a raging river? My kids can’t get enough of the Discovery Channel. Fortunately for me (and you!) the Discovery Channel, in conjunction with Miles Kelley Publishing, has released a new children’s book for the iPad and it is amazing. While this is more of and e-book and not so much an app, the Discovery Channel Animals book is totally worth mentioning. With 60 pages full of incredible animal facts and vivid, beautiful pictures, this e-book is sure to educate and entertain for hours on end. The book also includes video clips and 3D models for children who prefer a more ‘hands-on’ approach to learning. 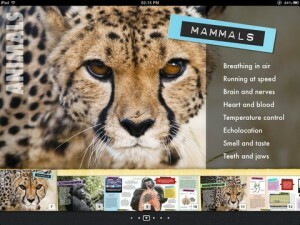 The blend of text, pictures, and video makes the Discovery Channel Animals e-book a strong and effective learning tool. This book isn’t just for children, though. I’ve spent a few collective hours reading through and watching the video clips and have enjoyed every minute! Available through Apple’s iBooks Store, Discovery Channel Animals will whisk your child through realistic animal habitats. Whether they are under the sea, exploring how dolphins swim, or engaging in a 3D model of an owl and its wings, there is no limit to the facts your child can learn about various animals and their habitats. However, this awesome book doesn’t stop with just animals; it encompasses a vast array of insects as well and is sure to please your bug loving child, too! Discovery Channel Animals e-book is available via the Apple iBooks Store by clicking here.